Standing at 685 Zhongshan Rd., Nantou County, Puli exists the oldest known red cedar in Taiwan. The tree is affectionately known to locals as ‘Old Red’, and is venerated fervently. Old Red towers up a massive 70 feet, has a diameter of 3.92 meters, a circumference of 12.3 meters, a crown of 300 sq. meters, and is estimated to be over around 1230 years old. According to local resident Mr. Bai, Old Red is about the same age as the 1000-year-old trees at Xingnan Temple. 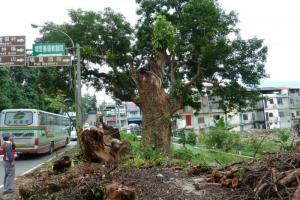 President of the Tree Conservation Society of Taiwan Zeng Cheng-rai, expressed that the tree’s rotten and hollow trunk resulted after the tree base was covered with over 1 meter of soil. To make matters worse, the soil used was waste soil from construction sites. So far the attitude of the Public Works Bureau in dealing with the red cedar has been largely negative, nonchalantly cutting away any diseased limbs from the tree, and showing very little regard for the tree’s welfare. We should really be doing our utmost to rescue Old Red, this beautiful ancient tree. As the use of cement and poor quality soil from construction sites was responsible for the dacay, Zeng Cheng-rai suggested using ultrasound apparatus to ascertain the degree of decay within the tree’s trunk, quickly remove cement and poor quality soil to improve the situation. After almost losing this tree due to faulty practice, the emphasis should now be on doing our best to rescue it. If we fail to act, the result may well be another lost generation of ancient old trees!